There are no button icons shown on my media capture screens (photo, audio, video). What went wrong? There seems to be an issue with some Android phones not showing the default buttons on the media screens. Until this is fixed, you can define your own custom buttons, as explained in the tutorial for capturing photos, audio and video recordings. My exported data is not shown in the downloads folder when I connect my phone to a computer via USB cable. What went wrong? This is a known bug in Android. A simple (although admittedly annoying) solution to the problem is to reboot the phone. After, all files should be correctly synced. When sending records via SMS, the phone receives messages with strange characters. What went wrong? 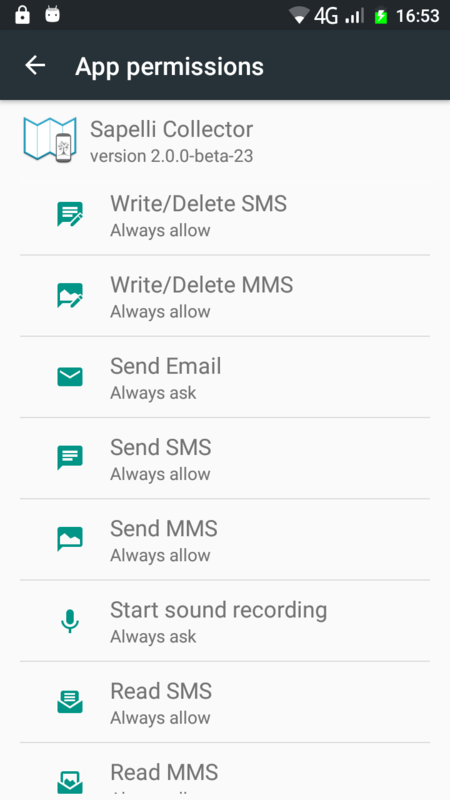 Make sure to tick the “Use binary SMS” option as described here. The receiving phone will not treat binary SMS as conventional text messages and they will be directly loaded into Sapelli without ending up as strange messages in your inbox. I setup Sapelli for SMS transmission but nothings is received on the other phone. What went wrong? First of all, make sure that all your settings are correct (phone number etc.) and that both phones are using the same Sapelli project and version as described here. Finally, if your device is running on Android 6.0 (API level 23) or higher, you probably need to allow Sapelli to receive and send SMS messages in the permissions menu. 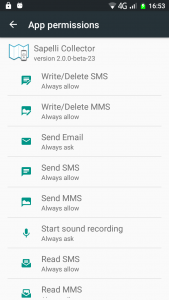 The permissions menu can be found in the device’s the settings and depending on the device’s manufacturer will look like the image on the right. Will there be duplicates on GeoKey if I send data via SMS to another phone and both phones are sending data to the same GeoKey server? No, GeoKey automatically detects duplicates and will not store the same information twice. If records and media attachments are transmitted at different points in time they will be automatically re-associated on GeoKey. Is it free to use Sapelli? Yes, Sapelli is and will always remain free to use. It is an open source project hosted here. Anybody can contribute to the project or fork and modify it. If you want us to implement specific, currently not supported functions, please get in touch with us and we will talk about pricing then. Our dev team is a very small group of researchers who have a big interest in you successfully deploying Sapelli in your projects. However, we cannot guarantee support for all individual projects and we hope to get away with providing this website as a reference. If you are really stuck though, you can try your luck by sending us a message and we will see what we can do.